New! 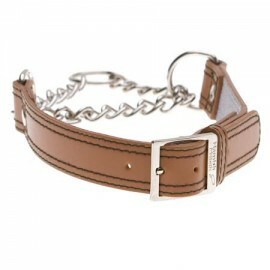 Hamish McBeth Leather Half Check Dog, available in 3 smart colours; red, tan and white. The Half Check collar is the perfect choice for the discerning owner that wants a sophisicated collar, with a little more control than a standard collar. The collar sits loosely around your dog’s neck when not pulling and tightens slightly if the dog pulls. This provides a gentle reminder to the dog to walk politely and is great as a training collar. Real top grain leather fitted with strong welded steel chain and ring. Available in 3 sizes, it features an adjustible buckle ensuring you can find the perfect fit to your dog's neck. Measurements provided are for the dog neck and not the collar itself. Sizes provided indicate the size of the collar in the 'closed' position when the chain is pulled tight.